Blood an Object of Awe. The importance of blood for the continuance of life must have been recognized even in most remote antiquity and under the most primitive conditions. Any one could see that the death of wild animals during the chase and of slaughtered domestic animals was due to loss of blood. Almost every one had occasion, more or less frequently, to notice that wounded men became unconscious after having lost a certain amount of blood, and that they died if the bleeding did not cease. "To shed blood" is therefore synonymous with "to kill," "to murder," and guilt for a person's death is expressed by "damim," plural of "dam" (blood). For instance, in Josh. ii. 19 the spies say to Rahab: "And it shall be that whosoever shall go out of the doors of thy house into the street, his blood shall be upon his head [ ], and we will be guiltless: and whosoever shall be with thee in the house, his blood shall be on our head [ ], if any hand be upon him." So long as the blood circulates, the man or the animal lives; hence the assertion: "The life [Hebr., "soul"] of the flesh is in the blood [ ]" (Lev. xvii. 11), and (verse 14), "it is the life [Hebr., "soul"] of all flesh"; R. V., "the blood thereof is all one with the life thereof." Even of animals it is said, "the life [Hebr., "soul"] of all flesh is the blood thereof [ ]" (ib. 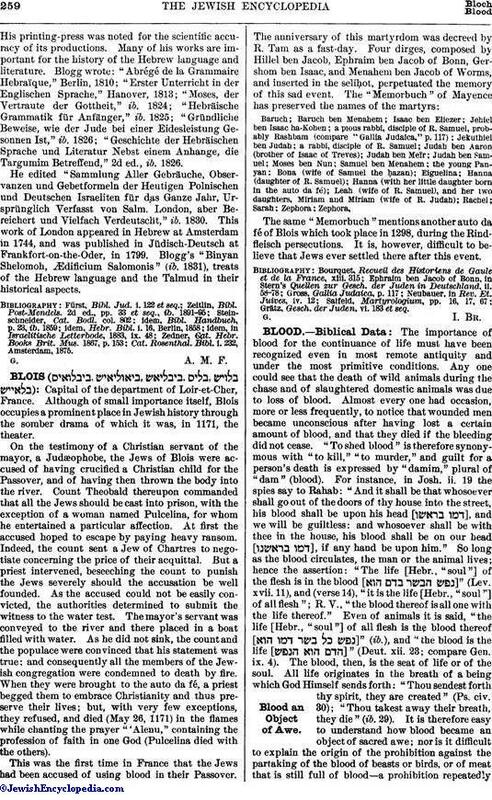 ), and "the blood is the life [ ]" (Deut. xii. 23; compare Gen. ix. 4). The blood, then, is the seat of life or of the soul. All life originates in the breath of a being which God Himself sends forth: "Thou sendest forth thy spirit, they are created" (Ps. civ. 30); "Thou takest away their breath, they die" (ib. 29). It is therefore easy to understand how blood became an object of sacred awe; nor is it difficult to explain the origin of the prohibition against the partaking of the blood of beasts or birds, or of meat that is still full of blood—a prohibition repeatedlyand explicitly emphasized in the Old Testament (Gen. ix. 4; Lev. iii. 17, vii. 26, xvii. 10, xix. 26; Deut. xii. 16, 23; xv. 23). That this law was really observed, and that its transgression was regarded as a sin, is proved by I Sam. xiv. 32 et seq. ; Ezek. xxxiii. 25; Judith xi. 12. The apostle (Acts xv. 29; compare xv. 20, xxi. 25) exhorts the Gentiles to "abstain from meats offered to idols, and from blood, and from things strangled." The ordinances referring to blood, "άπέχεσΘαι αίματος καὶ πνικτῶν," were obeyed by the Judæo-Christians from the very first (compare Clementine, "Homilies," vii. 4; Sibyllines, ii. 96), but by the Gentiles only after the historic books of the New Testament, and especially the Acts, were declared to be canonical. In J. G. Sommer's "Das Aposteldekret" (ii. 46, 60 et seq., Königsberg, 1889) it is shown how the decree in Acts xv. 29, under the influence of the Torah and of the Jews that were consulted, led to a new ceremonial law, the import of which may be gathered from the penitential ordinances, "Libri Pœnitentiales." It may be incidentally remarked that the Koran also forbids the eating of blood (sura v. 4; compare ii. 175, xvi. 115). In addition to their natural aversion to the tasting of blood, the Jews had another reason for abstaining from it, which is indicated in Lev. xvii. 11, where God says: "I have given it [the blood] to you upon the altar to make an atonement for your souls." God, in His mercy, ordained that blood should be a means of atonement; for which reason its place is upon the altar, and man shall not taste of it (compare also K. C. W. F. Bähr, "Symbolik des Mosäischen Cultus," ii. 200 et seq., Heidelberg, 1839). In conformity with the general development of Judaism after Ezra, the Jews of later times multiplied and intensified the commands against partaking of blood (compare especially Shulḥan 'Aruk, Yoreh De'ah, 65-68). There are explicit directions regarding the elimination of blood from food, such as the soaking and salting of meat to be prepared for the table (compare Eleazar ben Judah of Worms, in "Roḳeaḥ"; Naphtali Benet, in "Sefer Berit Melaḥ," Prague, 1816; Ludwig Stern, "Die Vorschriften der Thora," § 18, Frankfort-on-the-Main, 1882; compare also Dietary Laws). 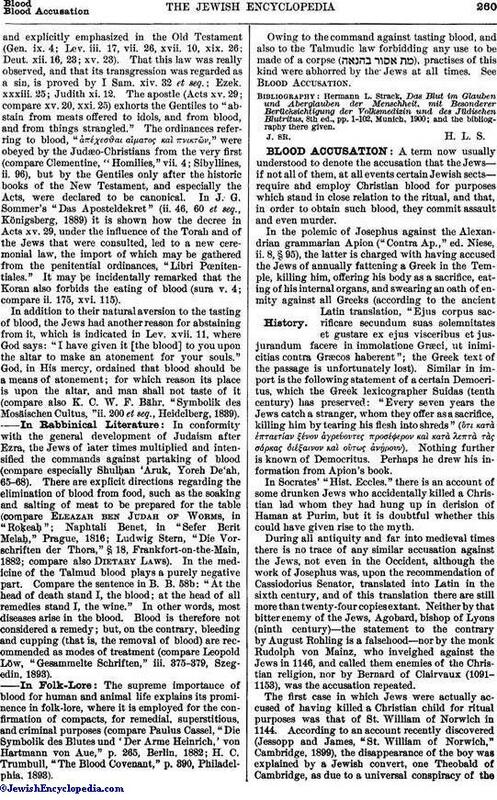 In the medicine of the Talmud blood plays a purely negative part. Compare the sentence in B. B. 58b: "At the head of death stand I, the blood; at the head of all remedies stand I, the wine." In other words, most diseases arise in the blood. Blood is therefore not considered a remedy; but, on the contrary, bleeding and cupping (that is, the removal of blood) are recommended as modes of treatment (compare Leopold Löw, "Gesammelte Schriften," iii. 375-379, Szegedin, 1893). The supreme importance of blood for human and animal life explains its prominence in folk-lore, where it is employed for the confirmation of compacts, for remedial, superstitious, and criminal purposes (compare Paulus Cassel, "Die Symbolik des Blutes und 'Der Arme Heinrich,' von Hartmann von Aue," p. 265, Berlin, 1882; H. C. Trumbull, "The Blood Covenant," p. 390, Philadelphia, 1893). Owing to the command against tasting blood, and also to the Talmudic law forbidding any use to be made of a corpse ( ), practises of this kind were abhorred by the Jews at all times. See Blood Accusation. Hermann L. Strack, Das Blut im Glauben und Aberglauben der Menschheit, mit Besonderer Berücksichtigung der Volksmedizin und des Jüdischen Blutritus, 8th ed., pp. 1-102, Munich, 1900; and the bibliography there given. J. Sr. H. L. S.